GB: Have you been pleased with the feedback you've received from fans and critics since the release of Vampire: Bloodlines? Leonard: Yes. We have been very pleased with the feedback and reviews of Vampire. GB: What sort of feedback did you receive from Valve on the final product? Were they impressed with the alterations you made to their engine? Leonard: During development they said they thought we were doing a great job. As for what they think of the final product, we have yet to hear any word from Valve as they've had a few things of their own to deal with lately. GB: Did you plan on including multiplayer in Bloodlines during the initial stages of development, or did you want to focus on a single player experience from the start? Leonard: The game was originally conceived as a single player game, and early on we thought it would be cool to include a multiplayer component as well. However, working with HL-2's multiplayer code in its early stages proved to be more work than we had anticipated, so we eventually decided to focus solely on creating the best single player experience. GB: Other than multiplayer, is there anything specific that you would have liked to have changed or added in the game if you were given more development time? Leonard: No matter what game you make, there are always things you have to cut. One of the coolest fluff pieces that didn't make it into Bloodlines was the classic Activision games in the arcade on the pier they were supposed to actually be playable (one of our programmers was friends with a programmer from another company that just made an emulator for all the old Activision games). How cool would it have been to actually play Pitfall at the arcade inside the game? GB: Although the game still contains plenty of language and gore, was there anything that was *too* graphic and had to be pulled? Leonard: Nope. I guess we're not trying hard enough. GB: The heavier industrial music in the game definitely sets the right tone in places like Club Confession and The Last Round. How did you decide on the performers and music for the game's soundtrack? Was it difficult to tap the resources of bigger acts like Ministry? Leonard: The music licensing was done through Activision. We weren't involved. GB: Do you think the release of Half Life 2 during the same week as Bloodlines had any effect on the sales of either game? Why or why not? Leonard: Activision doesn't ever discuss or disclose sales figures, and I can't speak for Valve regarding this question. However, I can say that it doesn't seem to me like there was any (safe) week to release games this year. If it wasn't HL-2, it would have been WoW, or Halo 2, etc. GB: Personally, I very much enjoyed the different traits available during character creation in Arcanum. Why were character histories like Eerie Presence and Rapacious Bloodlust removed from character creation in Bloodlines, and whose decision was it to have the feature removed? Leonard: When we created the character histories, Activision didn't think they could test them adequately in the time remaining and thought it would be safer to remove them. 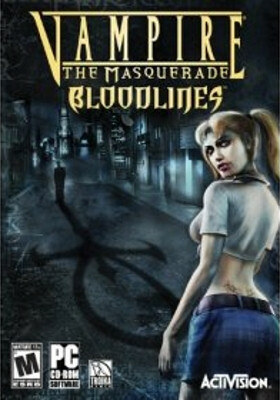 GB: Is it possible we might eventually see a Vampire: Bloodlines expansion or sequel? Who actually has to give a green light for further development? Activision? White Wolf? Leonard: That would be Activision's call. We'd love to do either an expansion or a sequel. GB: Now that Bloodlines has been finished, what is next for Troika? Any plans to officially announce your post-apocalyptic title in the near future? Leonard: That would be nice, wouldn't it? At the moment, I can't really talk about what's next for Troika so you'll just have to stay tuned. Will do, Leonard. Will do.